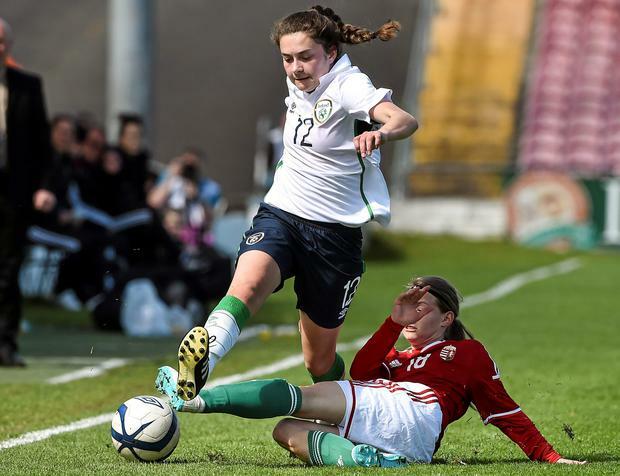 Ireland were unable to secure automatic qualification for the UEFA Women's U-17 Championships, but they are still likely to progress to the finals in Iceland as the best runners-up. A win over Hungary in yesterday's elite qualifying phase fixture at Turner's Cross would have sent Ireland through as Group 2 winners but the goal never came and England secured top spot with a win against the Netherlands. The 2-0 win over England last week should be enough to help Ireland qualify, but there will be frustration at not having won here. While Ireland played well after a shaky start, they were limited in their chances. Saoirse Noonan hit the bar in the first half and excellent captain Jamie Finn twice went close from second-half corners, but by and large Hungary's defending was stout. Already eliminated, the visitors didn't offer a lot of attacking endeavour but, even in the face of Irish pressure, they continued to put in a strong defensive effort. Nevertheless, barring an unlikely Finland win against Switzerland, Ireland should advance. Republic Of Ireland - McQuillan; O'Callaghan, Finn, Maloney, Prior; Meaney(McCartan 56), Noonan, Higgins, McLaughlin, McKevitt (Beirne 49); Ryan-Doyle.